We reviewed the behemoth Cooler Master Cosmos C700P almost exactly a year ago, and now CM is back with the even heavier 51.6lb C700M. Like the H500M versus the H500P, this is a higher-end and more expensive model being added to a family of cases rather than replacing them. The new flagship has a few upgrades over the original, but it retains the same basic look with pairs of big aluminum rails at the top and bottom and dual-curved side panels. Cooler Master’s C700M is very much a halo product, but our review of the C700M will focus on build quality, thermals, acoustics, and cable management. Ultimately, this is a showpiece -- it’s something one might buy because they can afford it, and that’s good enough reason. We will still be reviewing the Cooler Master C700M on its practical merits as an enclosure, as always, but are also taking into consideration its status as a halo product -- that is, something from which features will be pulled to the low-end later. If you went through our original H500P review and addressed each complaint one by one, the result would be the H500P Mesh, Cooler Master’s new mesh-fronted variant of the (formerly) underwhelming HAF successor. We previously built our own Cooler Master mesh mod, and the performance results there nearly linearly mirror what we found in Cooler Master’s actual H500P Mesh case. In our Cooler Master H500P Mesh review, we’ll run through temperature testing (thermals), airflow testing with an anemometer, and noise testing. Additional quality analysis will be done to gauge whether the substantial issues with the original H500P front and top panels have been resolved. 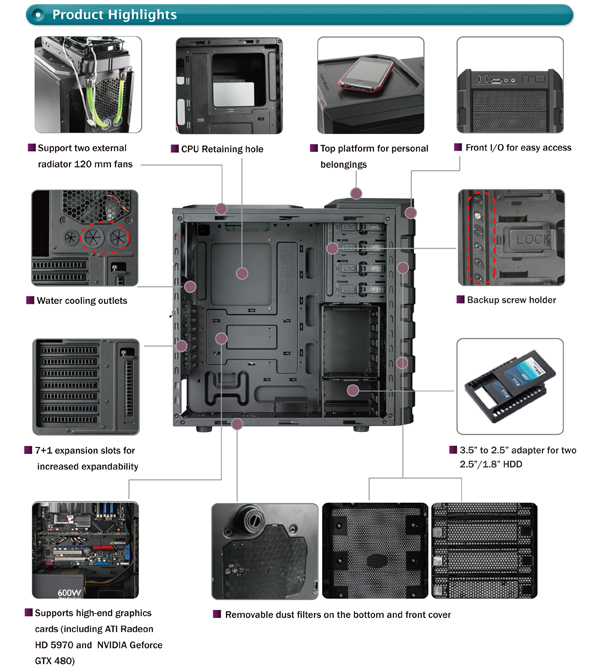 As this case is the same barebones chassis as the original H500P, we encourage you to read that review for more detailed notes on the build process. The focus here is on airflow, thermals, noise, and external build quality or other resolutions. As a reminder, the original marketing advertised “guaranteed high-volume airflow,” and suggested to reviewers that the case was a high-airflow enclosure with performance-oriented qualities. That, clearly, was not true, and was what resulted in the lashing the H500P received. Honest marketing matters. We have a long, known history with the Cooler Master H500P. Our review set the stage, with our mesh mod “fixing” the product (as we said), and the disappointment build closing-out the year. Although Cooler Master didn’t particularly like what we had to say (and challenged us on the mesh mod), it seems that the company took the criticism to heart. Nearly every issue we complained about has been fixed. The company never told us about these changes, of course – we had to hear about it from you all, via Twitter – but we found out, and we visited the suite to look at the H500P Mesh and H500M. The H500P Mesh enclosure fixes these primary concerns from our review: (1) The case falling apart, (2) the limited intake, (3) the power supply shroud installation procedure, and (4) the left panel no longer ‘wiggles’ or ‘wobbles’ side-to-side.